MaddenCo is in its second decade of assisting truck stops service centers handle their service operations. From one store service centers to operations with several hundred service centers, we have the tools to make your operation work at a peak level. Our Point of Sale system is designed to get your customer on his way quickly, but to also allow you to capture as much information as possible about your customer. Service centers can quickly lookup a customer’s vehicle, as well as view/print/email a customer’s full vehicle history. From there, it is easy to add or scan products and service items (and inspection forms) to a customer’s ticket and proceed to moving the order out to your shop. Finally, tendering out the customer is quick and easy, especially with our credit card integration. In addition to these features, MaddenCo has national account interfaces to Bridgestone, Continental, Firestone, Goodyear, Hankook, Michelin and Yokohama that makes handling these sales efficient for your sales staff. Long story short – we have what it takes to manage your operation. Please see more information about MaddenCo by viewing the Retail/Commercial section of our website. MaddenCo is more than just a Point of Sale system. 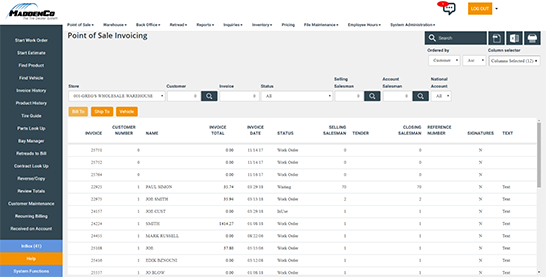 The Tire Dealer System will track your inventory as a single location, or across multiple locations. Our system is integrated with our own accounts payable and general ledger solutions, which allows us to eliminate your key strokes for data entry. Visit Retail/Commercial for more details or call us today at 812 474-6245.